1. FLASH WHEEL: Friction light, no battery required. Made of material ABS / A touch induction device built-in, without the use of electricity, so that the entire transparent wheel will light up. 2. 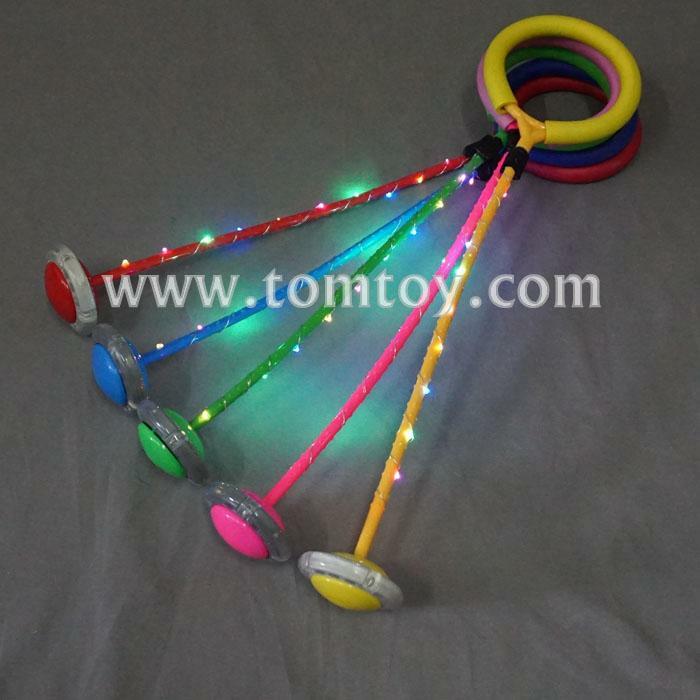 Intertwined with a LED wires on the support, operated by 1*CR2032 batteries, with 3 functions. 3. SUPPORT MATERIAL: Made of advanced PP/ PVC materials, transparent cover, wheel core, rubber cover and foot ring ,solid road made of wear-resistant PU plastic material, you can bend any, will not break- exquisite, durable, anti-aging, resistant to compression, low temperature and elastic. 4. SAFETY:The tail foot ring covered with high quality PP, better to protect kid's ankle -A special buckle design on tail foot ring, to facilitate the players put the feet into the ring. 5. HEALTHY EXERCISE:Everyone can be play with it,Keep fit and body slimming to adult/ Children jump, increased wisdom and happy. 6. BEST GIFT:A good gift for Christmas,Birthday,Thanks-Giving Day.